From high mountain springs to lowland coastal creeks, California’s 194,000 miles of rivers and streams drain a vast, diverse landscape. Within their channels and along their banks, these waters support dozens of native fish and other aquatic species. In addition, millions of state residents and tourists annually flock to California rivers to hike, swim, boat and fish. These recreational opportunities renew individual spirits and bolster local economies. California’s rivers are seriously threatened. Today, more than two thirds of the state’s native fish species are extinct, endangered, or declining and almost every river in California has been dammed or otherwise diverted. These magnificent waterways are also hardworking public servants. Rivers are owned by the public and have been developed to support public purposes. They are dammed and re-routed to provide drinking water, crop irrigation and hydroelectric power. Yet, as with all natural resources, we are challenged to find a balance between use and protection. 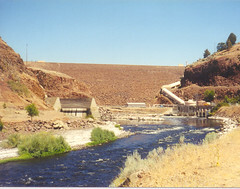 Many of the 300 non-federal hydropower dams in California are operated to maximize power generation. They divert up to 95 percent of a river’s natural flow into pipes or canals leaving miles of stream without water. Other facilities cause wildly fluctuating flows that erode soil and vegetation, and endanger fish, wildlife and people. 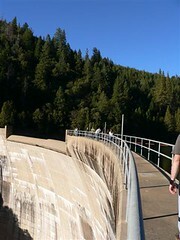 It is not uncommon in California for stretches of major rivers to run dry during summer months when utilities withhold or divert water to maximize energy production during peak energy demand. Most hydropower dams were constructed prior to the enactment of our nation’s environmental laws and have therefore been operating under antiquated terms for decades. These state- and utility-owned dams receive federal operating licenses that last 30 to 50 years. During this license term dam owners are not expected to modify projects in order to meet evolving environmental laws. No other energy sector receives such a free pass to avoid compliance. Not until the license expires is there an opportunity to evaluate how a project has impacted the natural environment and the public’s right to clean, accessible rivers. New licenses require dam owners to take common sense measures that improve habitat for fish and wildlife, reduce impacts to water quality and increase opportunities for public recreation. The hydropower licensing process offers a unique opportunity to restore balance to California’s most treasured rivers and streams. In the next fifteen years, over 150 dams will apply for new operating licenses. California has entered a critical era — a time when we have tremendous opportunity to restore a cherished resource, our public rivers.